In this day and age it can be hard to eat healthy. With your busy schedule, especially if you have children, many people find it easier to grab whatever is available and the quickest and deal with the health consequences later. With the following tips for soups on the go you’ll learn how to make sure that the food you grab is of the healthy variety. One way is to make foods that can be taken with you on the go. One of those foods is soup. Soup is tasty, filling, and good for you anytime, but especially on a cold fall or winter day. There are hot soups and believe it or not even cold soups. Many of the warm soups are even good eaten cold or lukewarm. First, choose your favorite soup. A popular choice of many is the infamous chicken noodle soup. There’s nothing better when you are under the weather than the warm chicken broth soothing your throat. Campbell’s has a wonderful soup in a microwave container perfect for eating on the go, but we are going to make our own soup for an even healthier choice. The one thing that is best about homemade food is that you know what is and is not in it. Since we are concerned with health, preparing your own soup creations at home is the best way to go. No matter which type of soup you choose to make, be sure to use fresh ingredients. The other items you’ll need are plenty of cups with lids and a blender. Now it’s time to actually create your time saving soup. A good soup always starts with the stock. For chicken soup, make the broth by boiling the remains of the chicken you had for dinner. Add the herbs and seasonings of your choice and boil until the chicken bones come out clean. Any remaining meat will be included in the broth. Once the broth cools completely, ladle it into air-tight jars or containers for storing. If you’re more of a beef and vegetable soup lover, you can use commercial canned broths or bouillon cubes for the base of your soup. Season the stock really well and boil before adding any other ingredients. Once the stock is ready, all that is left to do is toss in your favorite veggies. Again, wait until the soup is completely cooled before pouring into storage or serving containers. Now, what about that blender? It’s a bit difficult to eat soup the traditional way while driving and if you are serving to your kids, the combination of a car and soup in a bowl is a disaster waiting to happen. Here’s where the blender comes into the picture. 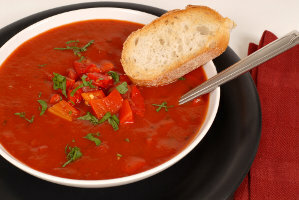 Pour some of the soup into the blender and blend until the pieces are small enough for you to swallow without choking. You can even puree the soup completely if you’d prefer. For a thicker texture, add a bit of cream soup. Now, your soup is ready for distributing in your to-go cups. The ideal cup would be a coffee mug with a lid. These types of cups have a wide opening perfect for drinking soups from. Be sure to prepare enough soup for the entire week. You can take the soup with you while you’re out shopping, working in the garden or to work. A cup of soup is packed with healthy nutrients and it won’t mess up the car or cramp your busy lifestyle. The next time you don’t have time to eat, reach for a cup of healthy homemade soup instead of pulling into that fast food drive thru.